Western blot analysis of extracts from various cell lines using ASK1 (D11C9) Rabbit mAb (upper) or Pan-Actin (D18C11) Rabbit mAb #8456 (lower). Immunoprecipitation of ASK1 from A-431 cell extracts using ASK1 (D11C9) Rabbit mAb (lane 2) or Normal Rabbit IgG #2729 (lane 3). Lane 1 is 10% input. 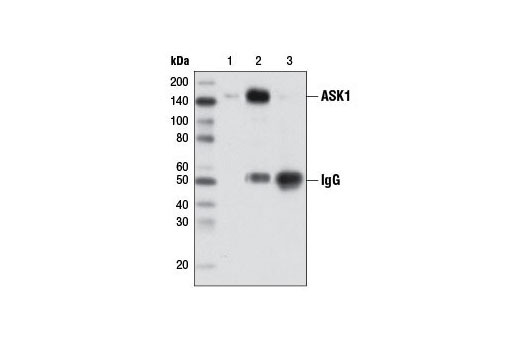 ASK1 (D11C9) Rabbit mAb recognizes endogenous levels of total ASK1 protein. Monoclonal antibody is produced by immunizing animals with a synthetic peptide corresponding to residues surrounding Ile280 of human ASK1 protein. Apoptosis signal-regulating kinase 1 (ASK1), a MAP kinase kinase kinase, plays essential roles in stress-induced apoptosis (1,2). ASK1 is activated in response to a variety of stress-related stimuli through distinct mechanisms and activates MKK4 and MKK3, which in turn activate JNK and p38 (3). Overexpression of ASK1 activates JNK and p38 and induces apoptosis in several cell types through signals involving the mitochondrial cell death pathway. Embryonic fibroblasts or primary neurons derived from ASK1-/- mice are resistant to stress-induced JNK and p38 activation as well as cell death (4,5). Phosphorylation at Ser967 is essential for ASK1 association with 14-3-3 proteins and suppression of cell death (6). Oxidative stress induces dephosphorylation of Ser967 and phosphorylation of Thr845 in the activation loop of ASK1, both of which are correlated with ASK1 activity and ASK1-dependent apoptosis (7,8). 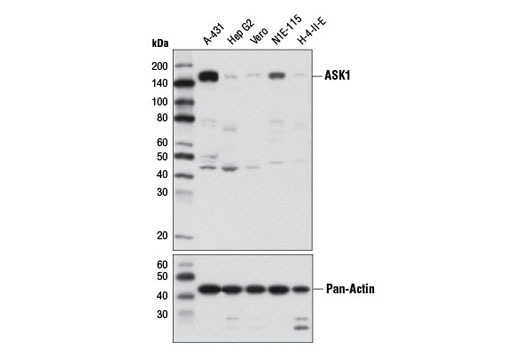 Akt phosphorylates ASK1 at Ser83, which attenuates ASK1 activity and promotes cell survival (9). Ichijo, H. et al. (1997) Science 275, 90-94. Wang, X.S. et al. (1996) J. Biol. Chem. 271, 31607-31611. Matsuzawa, A. and Ichijo, H. (2001) J. Biochem. (Tokyo) 130, 1-8. Tobiume, K. et al. (2001) EMBO Rep. 2, 222-228. Nishitoh, H. et al. (2002) Genes Dev. 16, 1345-1355. Zhang, L. et al. (1999) Proc. Natl. Acad. Sci. USA 96, 8511-8515. Tobiume, K. et al. (2002) J. Cell. Physiol. 191, 95-104. Goldman, E.H. et al. (2004) J. Biol. Chem. in press, . Kim, A.H. et al. (2001) Mol. Cell. Biol. 21, 893-901.